The last I wrote about Zika was almost more than an year ago (Link). Ever since, literature on Zika Virus (ZIKV) has grown tremendously. It is too much to ask for a summary of everything that is known about zika to date. For all my posts on Zika, refer this link. In this post I will give the most recent updates of interest. Zika virus has roughly a global distribution and 79 countries are in the spotlight. The geographical regions affected are categorised into 4 categories (Category 1-4). 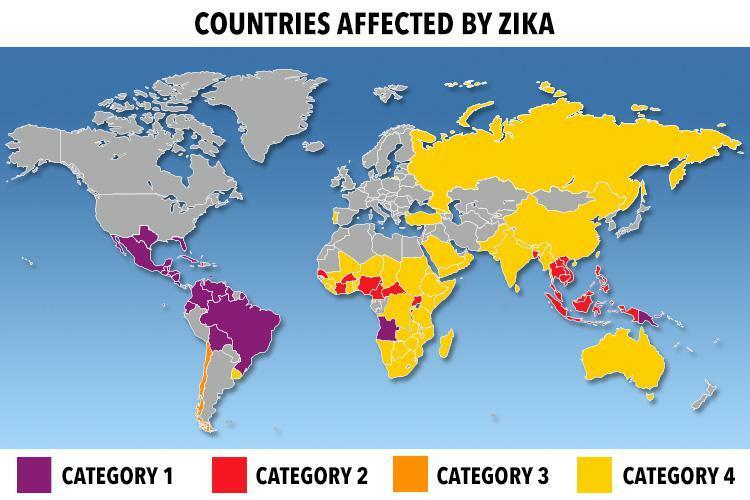 Category 1 represent countries with new introduction of Zika virus since 2015 with ongoing transmission. Category 2 are areas with either the evidence of virus circulation before 2015 or with ongoing transmission of the virus that is no longer in the new or re-introduction phase, but where there is no evidence of interruption. Category 3 are regions with interrupted transmission and with potential for future transmission. Category 4, where the Aedes aegypti mosquito that spreads the disease exists, but there has been no reported transmission of the virus. There are 2 hypothesis on why the ZIKV infection has emerged. The first is that the ZIKV infection was indeed causing infection earlier. But there was no targeted testing to detect them. The other is genetic hypothesis. As per this view, genetic change might have resulted in emergence of a virus strain with greater epidemic potential and virulence, causing epidemics with more severe disease. In a just published study a team of researchers have explored this hypothesis. The team strated with analysis of genetic differences between modern Zika strain and an ancestral strain isolated from a patient in Cambodia in 2010. Based on the initial analysis, a single serine to asparagine substitution (S139N) in the viral polyprotein was predicted as important. This was then proven with a mouse model which showed that virus with the S139N mutation caused the most damage to neuronal cells. As the author of the paper Chen-Feng Qin comments, "Besides host factors, such as low immunity to the virus in affected communities, there are definitely some other unknown viral proteins or amino acids that may contribute to the complex pathogenesis of microcephaly—independently or synergistically. Our study identified a unique genetic determinant that links to severe microcephaly". The exact mechanism of pathogen invasion is not known. There is some indication that the virus targets neuronal progenitors in the developing brain. Research has suggested that AXL receptor tyrosine kinase is the cellular receptor for the virus. But most probably this is not the only receptor. Given that the ZIKV infection targets glial cells, researchers have tried to use Zika strain to attack glioblastoma in a laboratory model. 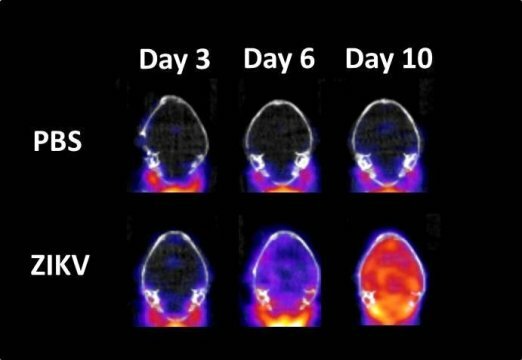 In a recent research using PET scanning (using a probe [18F] DPA-714) scientists have imaged the brain inflammation following Zika virus infection in mice. They found that levels of Zika virus in the mouse brain increased from day 3 to day 10 post-infection. 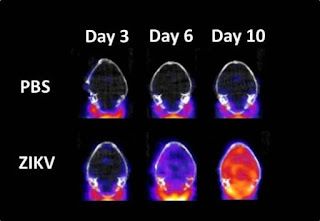 During the period, the mice showed a 2- to 6-fold increase in global brain neuroinflammation. The study highlited that despite Zika affecting local brain tissue parts, the inflammation extends to all parts of the brain. The focus of research currently is the cross reactivity between Zika and Dengue. 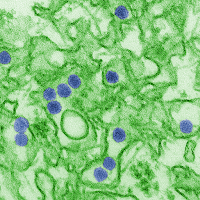 Zika and Dengue are closely related viruses. Both the viruses show antibody enhanced infection and hence there is the question as to how does dengue vaccine affect Zika infection. There is no clear answer to this question. There is some opinion that dengue infection enhances zika infection. More recently, it has been suggested that antibodies against DENV E-dimer epitope (EDE) not only neutralizes the dengue virus in mice, but also protects both adults and fetuses from Zika infection by neutralisation. The different findings in various papers is probably based on the various types of targetting antibody that is tested. Zika has gained strong interntational attention and there is a great focus on studying the Zika transmission, pathogenesis, treatment and vaccine. Estefania Fernandez, Wanwisa Dejnirattisai, Bin Cao, Suzanne M Scheaffer, Piyada Supasa, Wiyada Wongwiwat, Prabagaran Esakky, Andrea Drury, Juthathip Mongkolsapaya, Kelle H Moley, Indira U Mysorekar, Gavin R Screaton, Michael S Diamond. Human antibodies to the dengue virus E-dimer epitope have therapeutic activity against Zika virus infection. Nature Immunology, 2017; DOI: 10.1038/ni.3849.